John DiMone lost 40.2 lbs. in five rounds of 21 Day Fix. 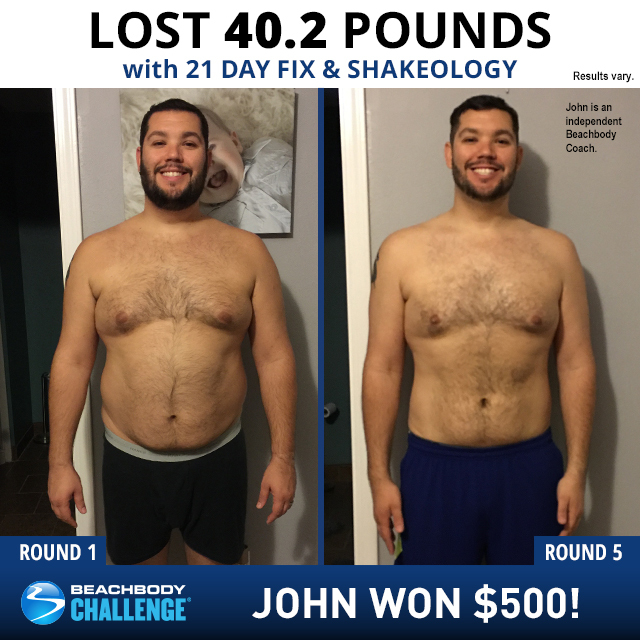 He entered his results into the Beachbody Challenge, and won the $500 Daily Prize for May 5th! Before beginning 21 Day Fix, I didn’t feel great about myself physically or health-wise at all. I was always embarrassed to take my shirt off. I lacked the confidence of being on the beach or even shirtless around the house. It was also frustrating looking at how many clothes I had not worn in a few years, because I had to get bigger sizes or used the excuse of “they must have shrunk.” I had always wanted to do something about my weight but never got motivated enough to stick to a program. I was inspired by the birth of my first child. He’s such an amazing and happy kid, and I would see pictures of us and think: “Wow. I look like that?” I know it’s not all about looks, but I wanted to be healthier as well. I knew that I wanted to be around a long time for my family. I wanted to be a motivation to him to be happy, healthy, and active while growing up as well. My wife told me about her friend who was doing a program called 21 Day Fix, and she gave me all the information about it. I was very skeptical about it at first, but then finally decided to give it a try. I’m so glad I did! The greatest challenge was figuring out how to eat right and do the right exercises at the same time. I would always try one or the other, but both together make all of the difference. Joining Beachbody has helped me tremendously build my knowledge base and gain confidence in how these workouts and eating programs can truly benefit me. 21 Day Fix makes it so simple to do both. It is totally the driving force behind my decision, and ultimately, my current success. I never thought I would be so successful in meeting my goals as well as wanting to motivate others so much that I signed up as a Beachbody Coach, because I love it so much. I like that the program came with everything I needed to get started right away. The Getting Started guide helped me learn how to properly get my nutrition in check. It also came with the containers that help with the portion control aspect. I achieved a loss of almost 40 pounds in just three short months. I toned my body and lost over 25 inches from around my whole body. I’m extremely proud of going down multiple sizes, and feeling extremely confident and healthy with my new body. I’m so motivated to help others achieve their fitness goals as well. My life has changed so much by my love for fitness and being healthy. Every day I tell people about Beachbody and the 21 Day Fix program. I let them know how much it means for me to want to help them achieve success and make changes to their lives. I have created workout groups at work and signed up to be a Coach, so I can put what I’ve learned to the test and truly help whomever I can with tips, motivation, products, etc. She pushed me more and more every day, and instilled confidence in my success. She made sure I had all of the tools I needed, and was available for help every step of the way. She would consistently challenge me to push myself and to not give up when I wanted to quit the program. I was pleasantly surprised to discover how amazing Shakeology tasted. It keeps me full and feeling amazing.